Copyright © 2014 Seán Silke/ Rohan Healy/ Alexander Healy/ David Anthony Healy. All rights reserved. No more than paying your dues in the world of music, often a similar period of hardship and perseverance can be required as regards affairs of the heart. The right person remains elusive. That mix of deep friendship, trust, confidence, fun and romance is rare. Yet sometimes – relatively late in life – it all comes to pass. An unrecorded recent song of mine, called “Late”, speaks of love arriving unpunctually yet still fresh, full-blooded and powerful. “Making the most of love” has a similar theme and benefits from a cracking melody in the chorus. The song has no specific back story, though I seem to remember that the kick off point for the lyrics was the phrase “I had already parked my dreams”. At least her dreams are not discarded but merely parked. And when all seems hopeless, “here you are / knocking at my door”. Are you gonna sleepwalk / The rest of your life? Copyright © 2017 Seán Silke/ Rohan Healy/ Alexander Healy/ David Anthony Healy. All rights reserved. Juan Gabriel, the famous Mexican singer noted for highly dramatic renditions of romantic songs, was once the object of a whispering campaign, alleging involvement in sexual abuse. When asked about this in a tv interview, his reply became legendary. What he said was “lo que se ve, no se pregunta”. This is hard to translate into English; the sense of what he said was – “In view of who and what you see before you, there is no need to ask that question”. Juan Gabriel was talking about character. You see who I am, he was saying. My character is known to all and has been for decades. It is obvious what kind of man I am. I adapted this lyric idea to feature in a song which uses the more prosaic English phrase, “No need to ask”. The singer asks her new lover to take on board what he must surely see. Live less in your head and respond to what is standing in front of you, she says. “Look my direction / I speak without sound”. In short, no need to ask. Copyright © 2013, 2016 Seán Silke/ Rohan Healy/ Alexander Healy/ David Anthony Healy. All rights reserved. A close friend died tragically in Peru in 2013. As the months passed, there was something very striking about the state of mind of her friends and family. They behaved as if she were a living presence. Some spoke of regular dreams where Maria “visited” and spoke to them. Her mother told me of seeing her on a bus journey into the city. A nun in Lima commented: “Our loved ones are still here as a vivid presence: we keep them alive by means of our memories of the good times”. This conscious decision to keep Maria alive by speaking of her in everyday conversation and refusing to let her go struck me as a very profound understanding of death and loss. In “Remember the good times”, I use the device of having the “dead” person sing the lyrics, communicating a message of love and hope from the “other side”. In relation to a 2013 dance song I wrote called “The Last Time”, I observed – “Our house of dreams is something we hold together with difficulty. At times we reconstruct it. And there also comes the time when it no longer exists”. This is also the theme of “Someone who no longer exists”. The lyrics speak of a young enthusiastic optimistic girl whose emotions have turned bitter. She finds herself deluded; she loves an illusion. The man to whom she gave her heart is now a different person. She blames her situation on allowing drift in her life – she is paying the price for never defining and never really taking hold of what she wanted. 5. WHO CAN SILENCE THE WIND? – But who can silence the wind? – Who can silence the wind? Who can silence the wind? Who can silence the wind? This song paints a picture of the funeral of Boris Pasternak, author of “Dr Zhivago”. A much loved poet in Russia long before his great novel appeared, a moving description of Pasternak’s funeral appears in Anna Pasternak’s “Lara – the untold love story that inspired Doctor Zhivago” (published by William Collins, 2016). In a Wikipedia article, a flavour of the mood behind the song can be gleaned. “Shortly before his death, a priest of the Russian Orthodox Church had given Pasternak the last rites. Later, in the strictest secrecy, a Russian Orthodox funeral liturgy, or Panikhida, was offered in the family’s dacha….Despite only a small notice appearing in the Literary Gazette, handwritten notices carrying the date and time of the funeral were posted throughout the Moscow subway system. As a result, thousands of admirers braved Militia and KGB surveillance to attend Pasternak’s funeral in Peredelkino. As the spectators cheered, the bells of Peredelkino’s Church of the Transfiguration began to toll. Written prayers for the dead were then placed upon Pasternak’s forehead and the coffin was closed and buried. Pasternak’s gravesite would go on to become a major shrine for members of the Soviet dissident movement. You can read the full Wikipedia article here. Copyright © 2005 Seán Silke/ Rohan Healy/ Alexander Healy/ David Anthony Healy. All rights reserved. Although categorised as a love song, “Crowded” is lyrically unconventional. The heroine realises she wants out of her current relationship. She feels hemmed in, overpowered by the attentiveness of her boyfriend. She finds herself not really sharing many common points of view with him, despite an initially promising start. Floundering may be a frequent state of affairs in the world of romance but songs rarely deal with the topic. Here, the lyrics are extremely direct, in stark contrast to the mellow melody. Shakespeare knew what he was talking about when he wrote “Parting is such sweet sorrow”. Love songs dealing with the topic of separation can be both incredibly sad and incredibly sweet. I wrote “Heading on home to you” for my wife who finds my annual 3-week absence in Peru hard going. The lyrics describe aspects of the South American landscape – fields of maize and sugar cane, rapid night fall, coach travel through wildernesses, and welcoming city lights. But mostly the song speaks of keeping faith with your loved one and being reunited. Copyright © 2004 Seán Silke/ Rohan Healy/ Alexander Healy/ David Anthony Healy. All rights reserved. Misinterpreting emotions is a constant danger in romances. What means a great deal to you may not resonate at all with your prospective partner. Yet because you react on a certain emotional level, you assume that your lover feels the same way. “In another life, in another world” talks of those dreams of the heart which are not necessarily shared. Nevertheless, the heroine continues to carry the flame, longing for a future opportunity when she will be cherished and worshipped as she deserves to be. The verse which mentions King Solomon is a reference to the “Song of Solomon”, a neglected Old Testament book full of sensual love poetry. O were you the only card life dealt me? Was I a careless fool to turn you down? Country songs would seem on the surface to be easy to write. The melodies aren’t adventurous, the lyrics deal with everyday life. And at times a songwriter can toss off a solid effort in an hour or two. But I find that simplicity takes a lot of time. “If you’re looking for love” first saw the light of day in 1983 but it wasn’t until 22 years later that a final satisfactory version emerged. So what was the problem? It’s hard to identify a good explanation now. The chorus was always strong; I think the verse was too complicated and I had to resist the temptation to be clever. Copyright © 2009 Seán Silke/ Rohan Healy/ Alexander Healy/ David Anthony Healy. All rights reserved. “Worthy to be loved” was also inspired by the spectacularly emotional scene in the Hugh Grant/Emma Thompson film, “Sense and Sensibility”, where a protracted and uncertain romance is resolved. Edward, an unemployed country parson, has been imprudently engaged for a time but has been released from this contract, although his first love, Elinor, is unaware of this development. Edward calls on Elinor’s home to seek her hand in marriage. When she realises the purpose of his visit and the fact that he is free to become engaged to her, she bursts into uncontrollable tears. Edward continues speaking, explaining that for years he believed that she felt only friendship for him whereas “my heart always has been and will be yours”. Emma Thompson’s acting is truly inspired, showing how years of repressed emotions are suddenly and unexpectedly released. You can watch the scene from the movie here. Lost my balance – how about you? To take the hand of one so unsteady? We speak in the western world of falling in love, of an assault on our senses, of something which shakes us to the core. “Lost my balance” teases out the emotions which falling in love generates – broken sleep, racing thoughts, a sense of uncontrolled drift, daydreaming about the loved one, a feeling of euphoria when sharing intimate moments. In short, the unbalanced heroine is “sweetly drowning in your charms”. A frequent theme in my lyrics is that of misunderstanding. In “Somehow it doesn’t sound the same”, the lovers use similar phrases to express their commitment to one another. But the meaning of these phrases is not identical. The song is set against the background of a romance which is coming to a close. In a hotel room, we see a girl about to “face the facts”. She realises that her lover is not trustworthy. He makes the correct moves but he does not tell the truth. She needs more than flattering “sweet talk”. But her instinct is to hang on to her illusions, even though he cannot deliver what she wants. In the final verse, she defines the kind of love she needs – attentiveness, respect, tenderness and touch. It’s not a bad summary of what sincere love can deliver. How can he get through it? That for which there is no cure? Roy and Claudette Orbison shared a love for motorcycles. They were travelling home from Bristol, Tennessee, on June 6th 1966 when she hit a truck which had pulled out in front of her. She died instantly. Roy Orbison’s mother used the phrase “He’s crying at last” when speaking to Fred Foster of Monument Records, months after the death of Roy’s wife, Claudette. In the wake of his overpowering loss, Roy shut down and only began to truly grieve and slowly recover long after the accident. Roy Orbison was a man acquainted with tragedy – in 1968 his two oldest sons died when his home burned down. “He’s crying at last” is a tribute to the unique writer and interpreter of such all time mournful classics as “In dreams”, “Running scared”, “It’s over”, “Crying” and “Only the lonely”. Copyright © 2016 Seán Silke/ Rohan Healy/ Alexander Healy/ David Anthony Healy. All rights reserved. This song is dedicated to my wife who tolerates my obsession with Peru and allows me an annual visit to the birthplace of our daughters. 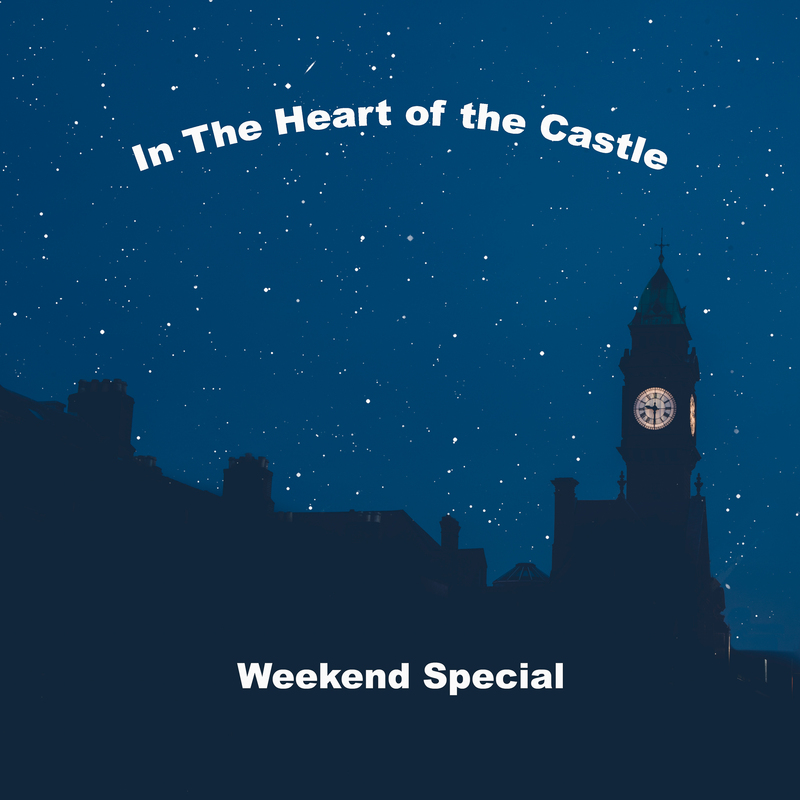 “In the heart of the castle” honours those who keep faith when patient waiting is required. The song remembers memorable events and places. Above all, it speaks to those whose energy and commitment keeps the flame burning at the very heart of home.